The right signage speaks volumes about your business. This is your opportunity to convey a message about your company — who you are and what you do. Say it with style and set yourself apart from the crowd. Think funky backlit window treatments or creative fabric panels. Use our drymount services for corporate mission statements and project boards. 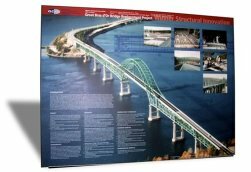 We deliver a durable commercially finished professional product that does not require framing. We offer rapid custom drymount services with custom painted beveled edges. For corporate posters we print from professional design packages such as Illustrator, Photoshop, Freehand, InDesign and QuarkXPress, as well as Microsoft PowerPoint. We also accept PDF files. We have a highly skilled production team, print in-house, and use only the best materials.